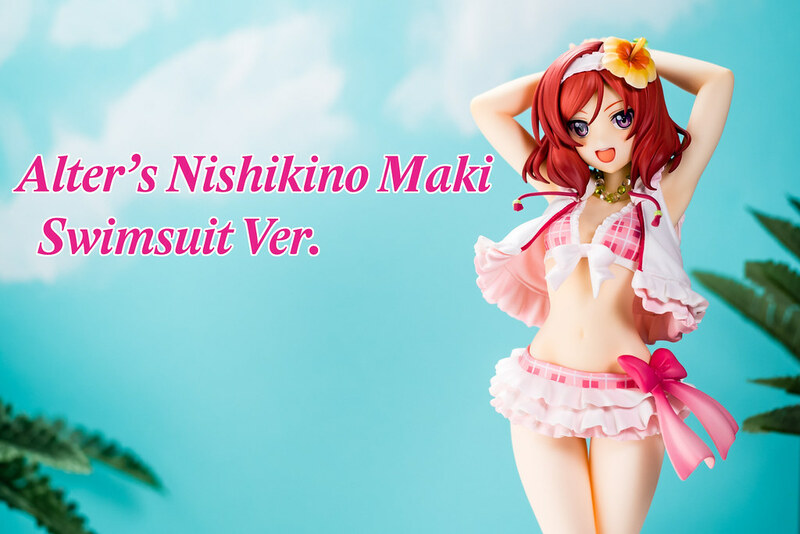 Alter's Nishikino Maki Swimsuit Ver. Hi peeps! How have you guys been? I hope everything is all good on your end! As for me? 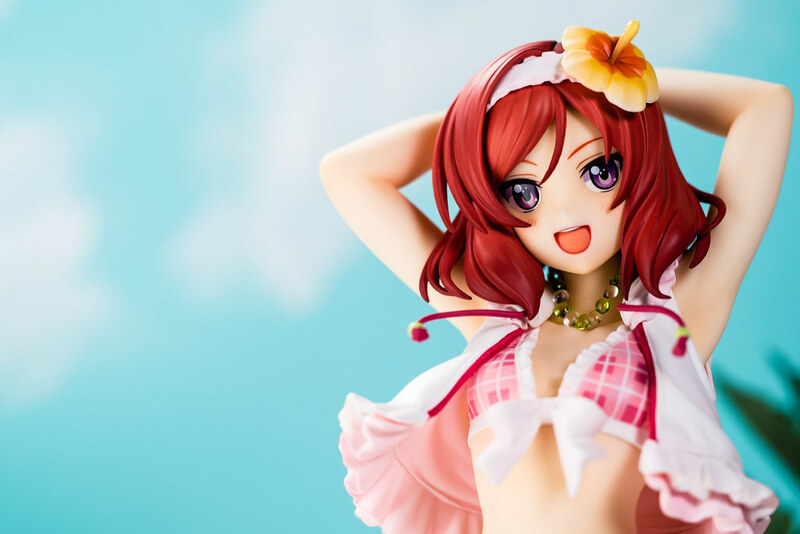 I have been spending some quality time with a lovely school idol, Alter's Nishikino Maki Swimsuit Ver. These past few weeks I have been all into Love Love! Last week I received the blu ray's released by NISA and I ended up rewatching the whole first season again. Then... I rewatched the first seven episodes again looking to get a friend to become a fan... and succeeded, yay! He is an Umi guy apparently!!! I originally watched the first season along with the second season last summer. Although, I always felt a bit guilty and wanted to rewatch the series at some point. When I first watched them I had them playing on my second monitor while I grinded away in Final Fantasy 14, I wasn't giving the show my full attention per se. When originally watching Love Live! I always had this nagging feeling, something about the characters really bothered me. It wasn't until much later after noticing how finely crafted their archetypes seemed to be, how they were made to appeal to the audience, that I finally understood what was bothering me. I was thinking too much about it. I was focusing too much on thinking about why this show was so popular and their characters so loved to spawn the rather large following in a fairly short amount of time. I was looking too closely at the components rather than enjoying the show as a whole. That is probably why this second time around I found it much more enjoyable. I ended liking all the girls unlike on my first watch, heck I'm going for a complete figma set now! The songs seemed a lot nicer than before and I ended getting the albums. I'm almost willing to go watch the movie on its premier next week on a work night. Although I might skip it since I would end up going alone, I don't like going to watch a movie alone. Since lately I have been into Love Live! I found this the perfect chance to motivate myself to take some figure photos. After all, I had the perfect pick at hand with the recent Maki from the good ol' folks from Alter. It's been a while since I sat down to do a proper indoor photo shoot, the last one was around late January. I think of this photo shoot as a warm up of sorts. Something to get back into the groove, to refamiliarize myself with using indoor lighting and try to get into building up a simple set up. Overall, I'm mostly happy with the photos I took. I'm thinking may be I should have gone a little less bright, go with something a bit more moody. Well, there is always the next swimsuit figure, there sure are a lot of those around. It's been a long time since I gotten an Alter figure, the last one was the always delicious loli Nanoha swimsuit ver. and Alter does not disappoint, Maki definitely turned out pretty much perfect. Even more so at those nice long legs that go on forever and ever! I'm always amazed at the small details figure manufactures manage to include in their figures. Things like the painted toe nails or Maki's necklace always blow me away. They might not look all that small in photos but in person they are tiny! My favorite part though, is Maki's smile! Maki being quite tsun tsun in the show doesn't really smile naturally all that much. I always loved seeing the scenes where she would crack a smile. I hope I get to see a sparkly smiling Maki in the movie when I get to watch it. Super happy with this rendition of Maki from Alter. I have skipped on Kotori and passed on Nico in favor of Good Smile Company's. I do look forward to see what the rest of the Alter girls will look like. By the way, made a Facebook page since all the cool kids are doing it.